The roof of a bungalow in Delhi’s upmarket Greater Kailash locality is teeming with gardening enthu-siasts. They include students and professionals enthusiastic about urban farming. The bungalow houses the office of Edible Routes, a farming consultancy with around 40 clients across Delhi. Experts say there has been an increase in the number of urban households growing vegetables for everyday consumption, but most need help in growing and maintaining the plants. Entrepreneurs have now started providing these services to urban customers. Edible Routes, for instance, charges Rs 2,000 per month and provides clients with fertiliser, cow dung biscuits, natural pesti-cides, pots and a gardener. “The city’s air and soil is so polluted that we have no clue about what we breathe or eat. We can solve this by growing fruits and vegetables on our terrace,” says Evanjelina, a fashion designing graduate who does voluntary work for Edible Routes. Edible Routes was started by Kapil Mandawewala, a management graduate who worked with Deloitte in the US before returning to his hometown in Jamnagar, Gujarat, in 2010. His interest in the agri-business made him start SajeevFresh (now Edible Routes). “We don’t know where the food we eat is grown or what chemicals are used to grow it,” he says. He moved to Delhi in 2014 to start the business. With a total investment of Rs 10 lakh, he started supplying fresh, organic vegetables to consumers and held workshops on terrace farming. He has employed 15 people, including three garde-ners, who are paid Rs 10,000-12,000 per month. Kapil says he is happy with the money he is making. Edible Routes has devised several interesting techniques for growing vegetables. For instance, they grow three-four plants in a single pot which helps the plants acquire each other’s properties. Growing basil and tomato in the same pot makes the tomatoes sweet, says Fazal Rashid, who works for Edible Routes. They have also designed special pots with holes centimetres above the bottom to let out excessive water, while the base is filled with coco-peat. This allows the plants to be watered only once every 15 days. Initiatives like Edible Routes have mushroomed in other metros like Bengaluru and Mumbai. Squarefoot Farmers, a Bengaluru-based company, helps clients to set up two types of urban vegetations—completely “edible” farms (having vegetables, fruits and herbs) and “landscaped” gardens (where herbs and fruit trees are entwined into the landscape with aesthetics as the focus). Owners of the company, Vishwas Makam and Arun Gundmi, were fascinated by the farm life, which drew them to the business. They now have a team of seven and organise workshops and set up gardens in Bengaluru and nearby cities. “We want to show that one can make money in this sector. All you need to know is the right direction to target customers,” they say. Sqarefoot Farmers charges its clients Rs 500-1,100 per sq m for plantations on soil and Rs 3,300-11,100 per sq m for landscaped garden on pots. Clients can avail watering solutions, gazebos and tensile roofing, furnishings and lighting facilities. Square-foot Farmers also make pots in different shapes and sizes from materials like pine wood, coir, PVC, CorTen steel (weathering steel) and stainless steel. A similar initiative is iKheti. Started in Mumbai by Priyanka Amar, an MBA graduate, iKheti claims to “create a platform for both individuals and communities to grow healthy, consumable crops within their premises and promote sustainable urban farming”. Apart from providing consultancy, raw material and maintenance/gardener services, iKheti also does beautification and green-vamping of rooftop and patios. Their clients include individuals, residential societies, corporates and educational institutes. Talking about her business, Amar says she started with an initial investment Rs 75,000 in 2011 and it took her two years to break even. 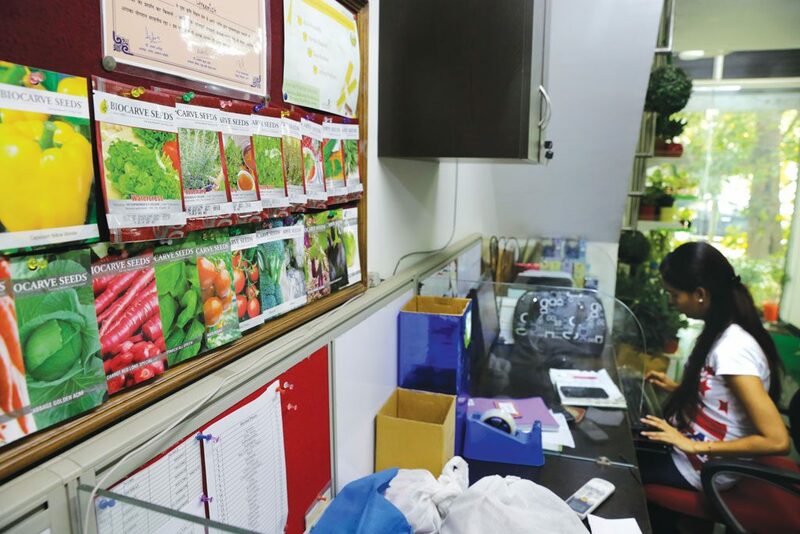 The company charges its clients Rs 2,000-4,000 for a herb garden on the terrace, while a mix of herbs, vegetables and fruits costs Rs 2,500-12,000. The cost of raw materials is included in this. The Living Greens, a Jaipur-based organisation, provides farming techniques that are pesticide-free and organic. They help farmers grow vegetables using a fraction of the water used in normal farming. 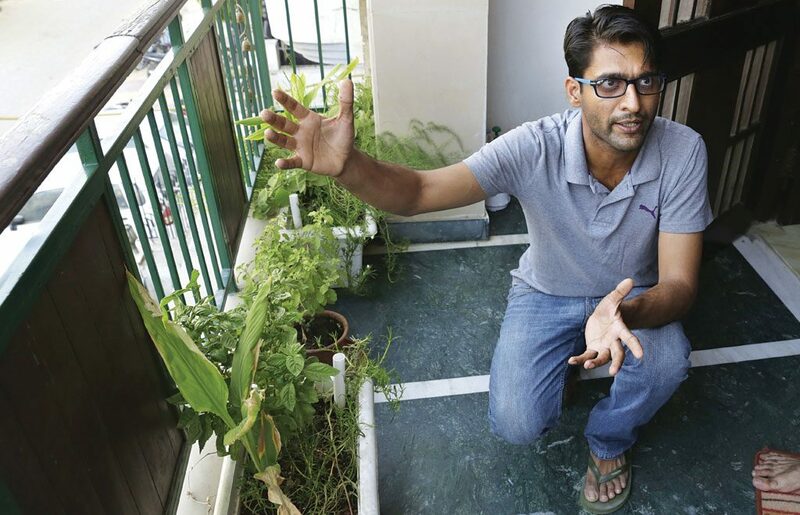 The company charges Rs 13,500 for a portable rooftop organic farming unit of 40 sq ft (R3,750 per sq m) and provide bio-pesticides, pot mixtures and grow bags. They also make follow up visits for maintenance. They use only 20 litres of water to grow 1 kg of vegetable. “We cannot share our margins with you but we can tell you that despite being a two-year-old start-up, we are breaking even most of the months,” says Prateek Tiwari, founder and CEO. He works with a team of 19 people and has around 130 customers. Recently, the company’s business model was selected among the top eight agri-business models by the Agri Food Business Accelerator, a joint venture of the IIM-Ahmedabad and the National Academy of Agricultural Research Management. Apart from these somewhat expensive services, there are cheaper options available too. For instance, Hariyali, a nursery in Hauz Khas, New Delhi, provided gardeners at a monthly cost of Rs 800-1,000. Ravindra Ahuja, who owned the nursery, ran it for the past 25 years. Currently, the place is being run by his daughter, Saniya, and has been re-christened Greenish. They have also started providing other services such as laying beautification patches in hotels and offices. Their clients include the Australian High Commission, the Oberoi Hotel, Moolchand Medicity and MNCs like Larsen & Toubro. The idea of such agri-business initiatives is fast gaining acceptance. Delivering a lecture at the Administrative Staff College of India, Hyderabad, Sanjeev Chopra, joint secretary, agriculture ministry, said, “It’s time that agriculture in urban areas is promoted. Governments and institutions should focus on this. Agriculture is no more just a rural affair. The priority should be to use the available infrastructure in urban areas”.